If you are an artist, or just look like one, and can either draw something or write a clever phrase and typeset it, there are many websites no w that will allow you to upload that design to their commerce platform. The website will take orders for your design on T-shirts, mugs, cell phone cases, and tons of other products, will print the items to order and ship them to the customers, and then pay you your percentage of the sale. The production method is referred to as Print-on-Demand (POD). Services that provide QTYONE production of T-shirts and other items that can be printed using a color inkjet printer have been around for a long time, and the market has established that in most cases there are no upfront fees for the artist to use the service. All the artist needs to concentrate on is creating new work and promoting the work. The artist gets paid for each item sold and is making money right from the first item sold — a perfect example of QTYONE. To provide an example of such a service in action, I have created a Spreadshirt.com shop that offers products with the QTYONE logo. 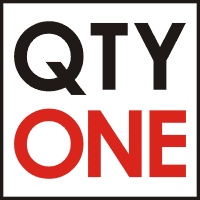 Purchases of the QTYONE logo merchandise will help fund continuing development of this site. This kind of one-off inkjet production of merchandise has been around for a while. Back in the early 2000’s, I had a CafePress.com store that sold merchandise with my ferret photography that I was doing for my magazine, Modern Ferret. The magazine promoted the CafePress store and the store provided thousands of dollars per year of revenue to help support the magazine. 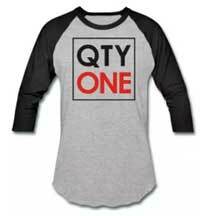 Over the years, the ability to product QTYONE merchandise has improved — both in terms of the quality of the finished product and it terms of the number of products that can be produced. I think that this is still an area that will experience a lot of growth — as 3D printing becomes more popular and inexpensive there will be all kinds of new ways to produce QTYONE products and all sorts of innovative products created. I’ve been discussing business stuff with my friend Adam for roughly 30 years at this point. In that much time, we’ve managed to develop a bit of our own jargon and we’re able to reference all kinds of things we’ve experienced. Adam’s concept of “a quantity of one” has come up again and again in different contexts and business situations. In my own business experience, I’ve gone from printing thousands of a paperback book, to being able to cost-effectively digitally print 200 copies, to now being able to super cheaply print a single copy of a paperback with CreateSpace. Currently I’m working on card and board game ideas, and it is just now becoming possible to cost-effectively print a single deck of cards or board game. In the interview below, I’ve tried to ask Adam some questions to get a more generic description of his “Quantity of One” concept. This video shows me opening the package with the deck of cards that was referenced in the discussion. It was printed by TheGameCrafter, a company that is able to print games and game components (cards, boards, boxes, and more) one at a time. A quick discussion with Adam Post about his QTYONE concept, recorded on September 16, 2016. You can listen to the discussion here or download the mp3. The transcript (minus some “ums”) is below. For some context on this, that deck that you saw was printed with TheGameCrafter. And I know we’ve discussed this a lot before, you were the one who actually pointed out to me — I think it was years ago — the importance of a quantity of one. Any of your thoughts in the moment about being able to produce something in a quantity of one and sell it? Quantity of one is the ultimate leverage when you’re producing something. The whole purpose of any business — whether it’s a restaurant or a manufacturing company or a distribution company — is to be able to service one order at a time. All the resources, all the coordination, all the investment, all the problems, all the efforts, everything you’re doing, is so that you can produce a series of quantities of one. So if you have a methodology for producing a quantity of one and you can remarket that and make money, it’s fantastic. Because you can do that without tremendous amounts of investment. Which is why micro publishing and micro production is a great thing. You’ve also said in a previous conversation about this that all business is an aggregation. the systems, the processes, the men, and the machinery to make that quantity of one or series of quantities of one. Anything else you want to add? That really covered it though.